This past Friday I had the privilege of going to show-n-tell with my son. What does this have to do with a LEGO art website? Glad you asked! Christopher’s teacher had asked for parents to volunteer to come in and tell about their jobs. While my LEGO freelance artist thing is nothing like a full-time job right now, I thought it would be something that the kids could relate to. When I asked the kids if any of them had ever built anything with LEGO I was practically knocked over by the verberations in the air from 20+ hands shooting straight into the air. Okay, so I wasn’t really knocked over, but I don’t think I’d ever seen that many hands go up that fast. And you want to talk about an engaged audience? I was blown away (again, not literally) by how into it these kids were. Christopher was my helper and we showed his classmates LEGO Green Eggs and Ham, a life-size batch of Chocolate Chip Cookies and Milk — something my wife and both boys had fun helping me put together. Then we showed them the giant LEGO chocolate chip cookie. And finally the jigsaw portrait puzzle I had built of Christopher’s face. That one I pulled out in the six individual pieces first and let the kids guess what it was. Several of them could see his face in it before I had the last two pieces on, so that was really neat. So that was my ten minutes of Friday fame. Lots of fun. 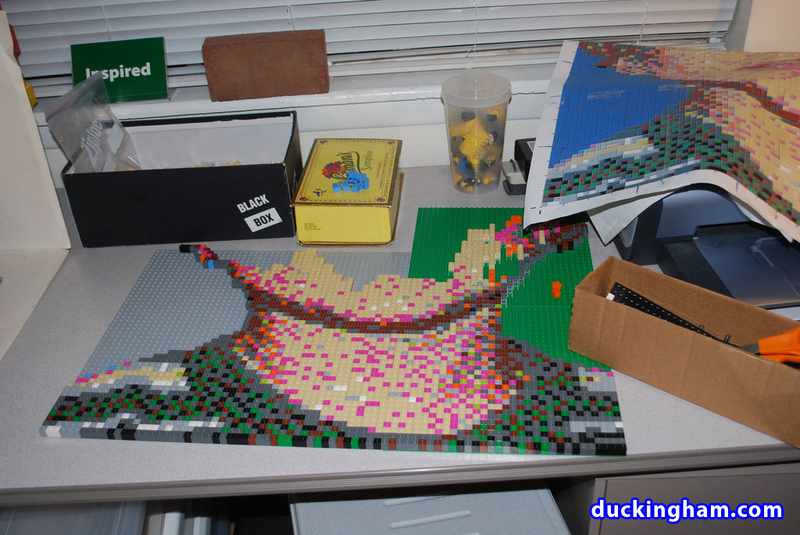 For a sneak peak into the future, here’s a picture of a new LEGO portrait I’m working on of our second-born, Patrick. Stay tuned for updates!